13 FLIGHTS!!!!!! Shrieked the wife. Darling South America is a continent And on that note started our 25 day long exhaustive and exhausting South American sojourn. Oh! To be in Rio when the Carnival is there is the ultimate dream of many tourists to this continent and we were no different. 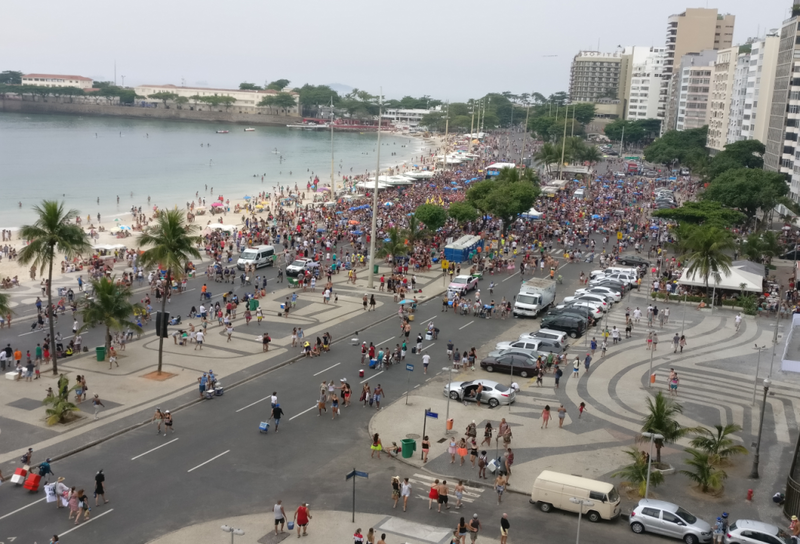 The whole city was under Carnival fever and if your hotel is on Copacabana, you can do the samba all night long. Rio de Janeiro (river of January) was christened so by the Spaniards when they first discovered it on New Years day in 1502 as they thought they were entering into the mouth of a river from the Atlantic ocean. 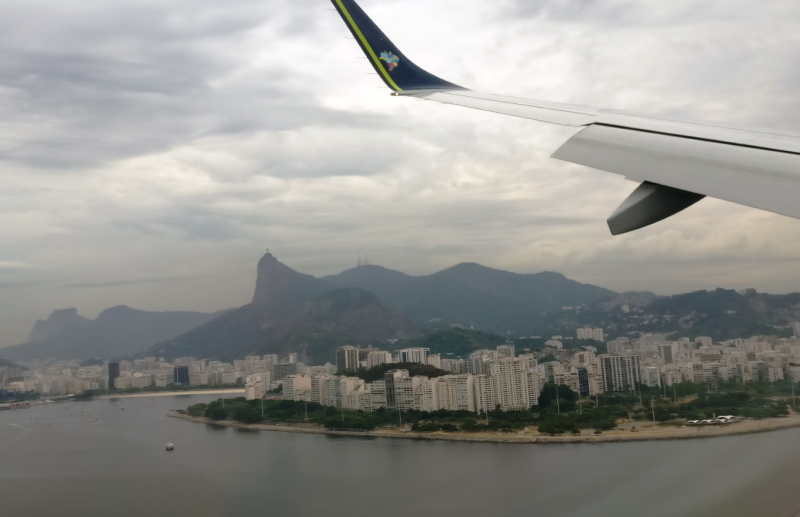 Rio – the vibrant city of 12 million inhabitants is also famous for the Christ the Reedeemer statue that stands atop the Corcovado mountain set amidst the Tijuca rain forest. 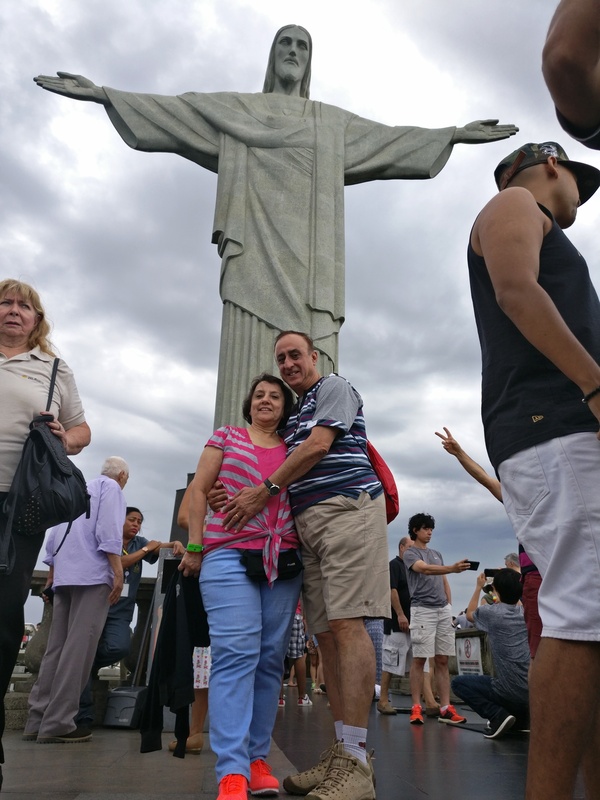 The 90 metres statue with open arms indeed gives a feeling of a warm embrace to all visitors to Rio and Brazil. The other tourist attraction is the Sugar Loaf mountain which can be reached by two cable car rides. 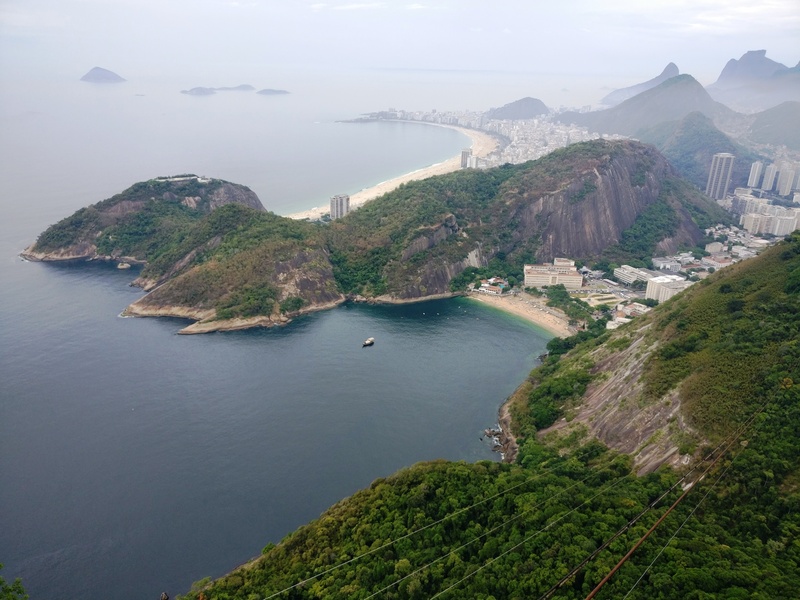 The mountain is 400 metres high and one gets a wonderful view of Rio as well as the Atlantic ocean on all sides. No trip to Rio can be complete without visiting their famous favellas. The favellas are a very refined and clean version of our Dharavi slums and one can feel the pulse of the town in them. The sun was setting and we made our way to the SAMBDROME to experience the sheer magic of the spectacular carnival parade. In the sambadrome which is a strip of half a kilometre lined by stands and VIP boxes on either side, the top dozen schools of Samba use their skills and imagination to outdo each other with sheer genius and artistry of their various floats. Six schools parade each day and the event starts at 10 in the night and goes on until 6 in the morning. The colour, pomp and pageantry is simply mind blowing and jaw dropping. 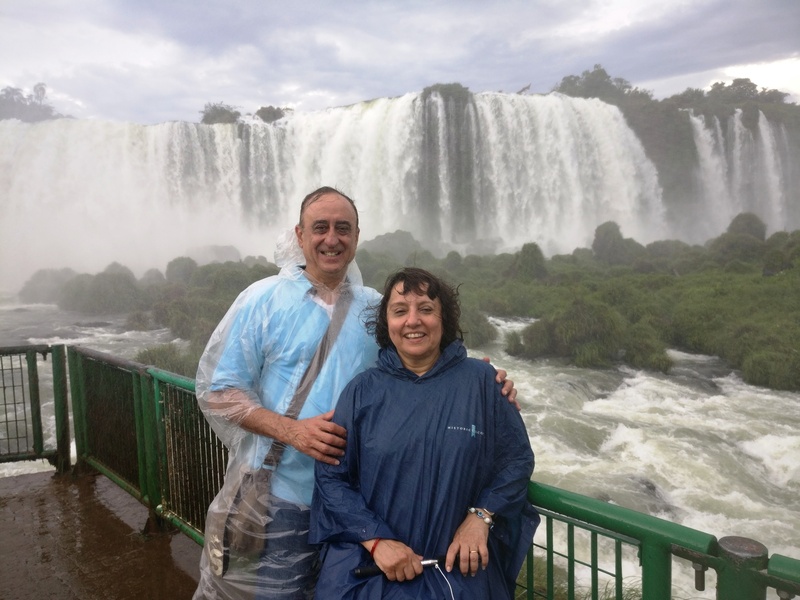 After the parade we said au revoir to Rio and flew to our next destination – the Iguazu Falls. There are falls and there are falls and then come the Iguazu falls. Visible from both the Brazilian and Argentinian sides. Stretching across a width of 2.7 kms and varying from a height of 60 to 90 metres, the highlight of these spectacular natural wonder is the Devil’s throat (garganta del Diablo) a long chasm that is 82 metres high and 700 metres wide giving it an impression that the water is thrust down the throat of the devil. One of the natural wonders of the world, the iguazu falls are a sight to behold. One can walk on the special walk ways and come thunderously close to the Devil’s throat and get completely drenched.This in itself is a once in a lifetime experience. 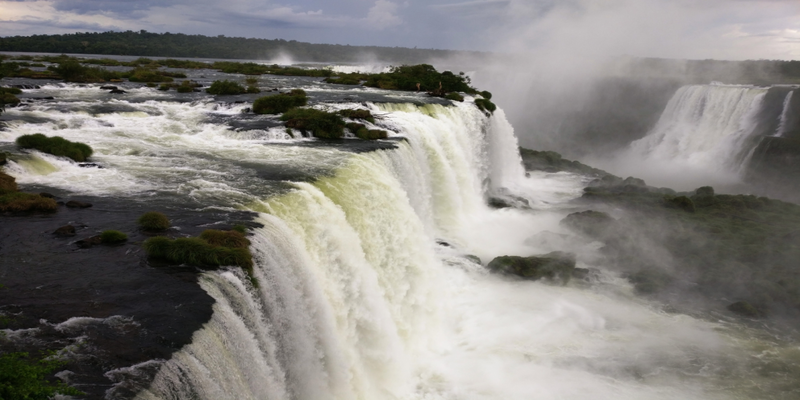 One must see the falls from both the countries and enjoy the train ride in the Iguazu national park in Argentina. This national park has an unique animal called the Coati, but care should be taken not to touch or cuddle it. After a wonderful two days at Iguazu, it was time to move on and see water in its frozen form. 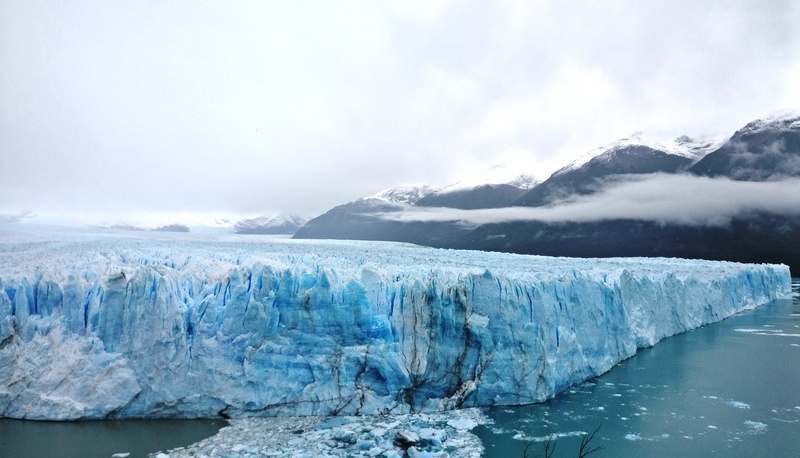 Yes, folks , yet another Natural wonder of our planet , tucked away at the bottom of the South American continent in Argentina in El Calafate – a picturesque small town, named after a delicious berry called Calafate, are the world famous PERITO MORENO AND OTHER GLACIERS. Nestled in the southern end of the Andes mountain range which runs through the South American continent, the region is an UNESCO world heritage site and is located in the Los Glacieres National Park in southwest Argentina. Covering an area of 16000 sq kms, the glacier is the second largest continuous icefield in the world. Almost 220 miles in length and 30 miles in width. One can take a boat cruise and also walk the designated trails to get as close as a furlong from the glacier. With a little bit of luck, a tourist can also witness atleast a dozen calvings of the glacier. Blocks of ice separating from the main body and falling in the water is a “Calving”. These floating blocks of ice on the water in different shapes are known as Icebergs. Again like the Iguazu falls all the adjectives in the language cannot do justice to describe this mother nature’s beauty and bounty. After a very relaxing three days in this breathtaking surroundings we move up to the capital of Argentina – Buenos Aires. From the Samba beats of Brazil it was Tango time in Buenos Aires. No visit to Buenos Aires can be complete without seeing a Tango Show and one has to be selective and see a really top class performance which will take your breath away. The sheer artistry and dexterity of the Tango dancers as they dance away in their Tuxedos and Gowns is a sight to behold. Populary known as the Paris of South America, Buenos Aires(the name conjures up the Spanish meaning Good Airs or Fair winds) is a sprawling megapolis of over 12 million residents. The city tour takes you to Plaza de Mayo or May Square – the place where all the revolution events in Argentina have taken place, mention here needs to be made of the Diapers drawn on the square by the mothers whose babies were taken away during those days and they are known as the “diapers of the missing babies. Another unique program of the tour is the Recoleta cemetery where the final resting place of the iconic Argentinian lady Eva (EVITA) Peron is. The serene surroundings and the rich architecture of the various tombstones make the cemetery a must visit. Of course another must see in Buenos Aires is the famous BOCA juniors soccer stadium. Walking the cobbled stone streets in the old locality of San Telmo where you find Tango dancers trying to grab you to pose with them for a small fee is another unique experience. The next day was spent in a visit to the Tigre Delta. Many have a misconception that Buenos Aires is on the Atlantic Ocean, actually its 200 kilometres away from the Atlantic and is located on the banks of the Rio de la Plata which is a whopping 220 kilometres wide when it flows thru Buenos Aires. Hence all ships including big cruise liners come right into Buenos Aires chugging along on the Rio de la Plata. Now on to Tigre(tiger in Spanish) some Spaniards must have seen a wild cat after downing a gallon of wine and mistook the cat for a tiger hence the delta got its name. That’s what our tour guide of the day told us and also the sign board to the entrance of the town of Tigre testifies to it. So you go sailing down the de la Plata river and reach Tigre – It is a very pleasant one hour sail , the banks being dotted by quaint little houses on either side. The only catch is that you can reach your house by boat – there is no road transport here. 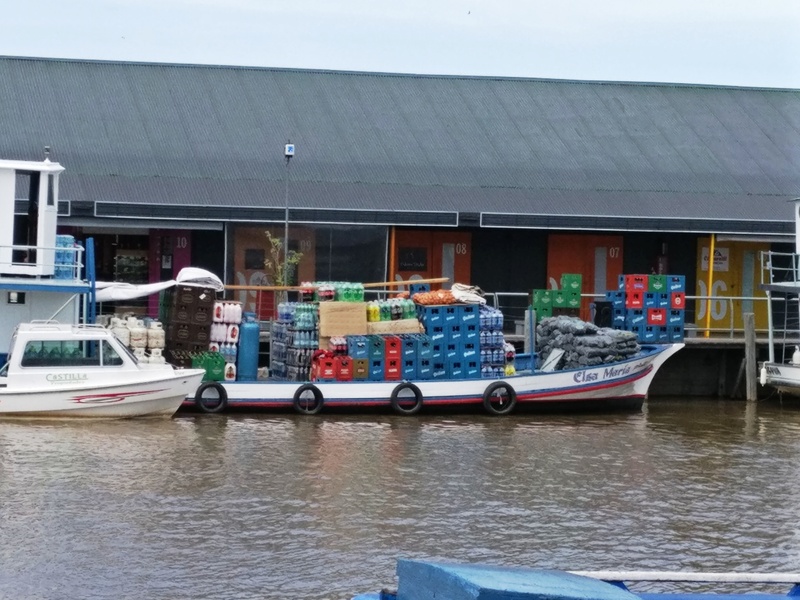 Also all wares are sold by boats, so there is a boat called super market boat. Even the mail is bought by the postman on a postal boat. Before saying hasta la vista to Buenos Aires, I have to mention the famous Argentinian tea called the Matte – a herbal concoction and quite bitter in taste. You have it from an unique cup and yours truly did try it. An early morning flight via Santiago in Chile took us to our next town and country on the tour map, Peru and it’s capital Lima. 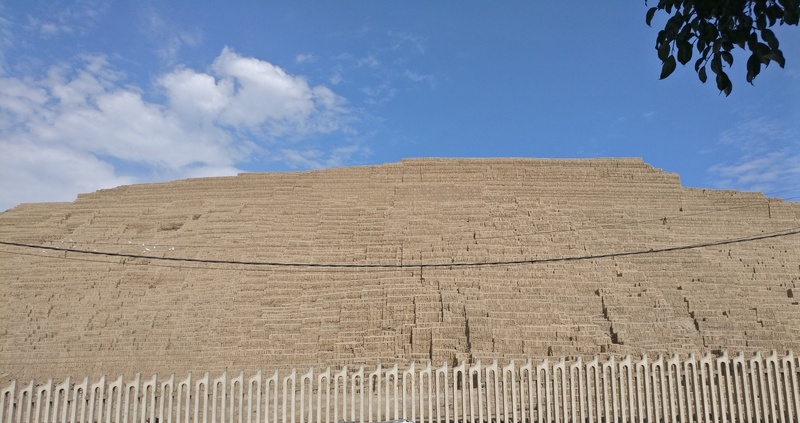 I will regret it for a longtime that I couldn’t spend more then half a day in Lima in which we did only the City tour of this beautiful town located on the Pacific coast. Three rivers the Chilon, Rimac and Lurin run through the town. 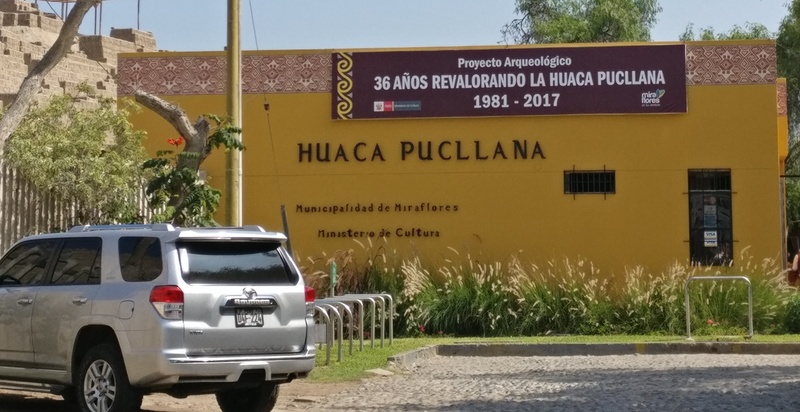 One third of the population of Peru which is 30 million lives in Lima, founded in 1536 by the Spanish conquistador Francisco Pizarro, Lima can boast of the oldest running University in North and South America since 1551. Apart from the town square and the wonderful old buildings we also visited the San Francisco convent with its priceless pieces of art and the catacombs. Unfortunately photography was strictly forbidden in the convent. Please do try the famous Limean drink the Pisco sour a concoction of their local arrak and eggwhite with a dash of lime and angostura bitters, very potent and downing a couple will make you do the Peruvian dance the MARINERA haha. Their famous local dish Lime marinated seafood the Ceviche will go well with the Pisco sour. Paucity of time didn’t allow us to taste it unfortunately. Peru is the worlds largest producer of silver and also has substantial quantities of Gold and natural gas. From Lima a short flight of an hour took us to Cusco(which stands for belly button in the ancient Inca language) – the ancient capital of the INCAS. Located at an altitude of 3800 metres and cool bracing climate this lovely town of half a million inhabitants has some stunning old archeological sites of the INCA empire. 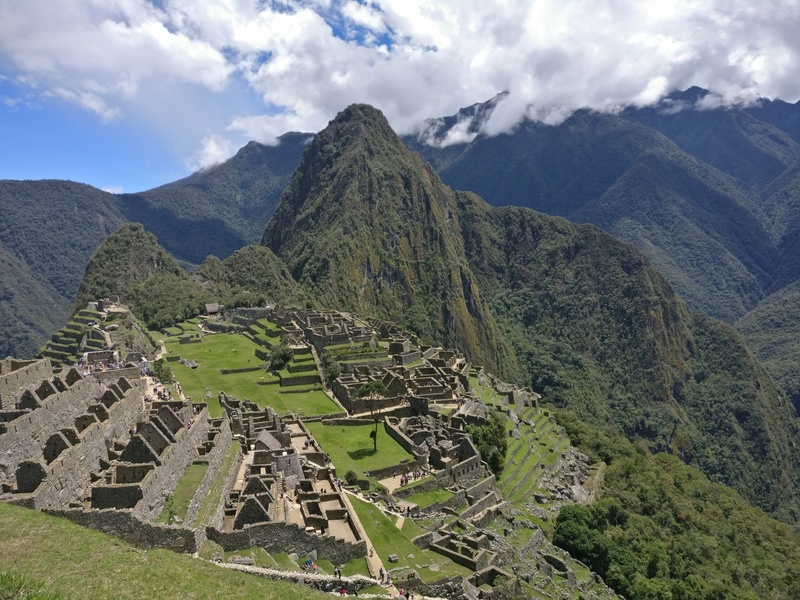 The Incas ruled Peru for 350 years and had a great civilization in this part of the world before the Spaniards came and destroyed it in the mid 16th century. But fortunately several temples and old buildings of those times have survived the ravages of time. The greatest of the Incan emperors called Pachakuteq, took great interest in the development of Cusco and gave the town a shape of a Puma, which at the time of the Incas was an animal respected for its sacred power and strength. The Sun temple (qorikancha) is a must see. The Cusco Cathedral located in the main square of the the town is simply awesome and can rival any cathedral in Europe. Their version of the last supper painting is spectacular. This cathedral has been cleverly built on the foundation of the palace of Inca emperor Wiraqocha and took over a 100 years to build. Sacred city valley and of course the Piece de resistance of the whole trip the famed Machu Picchu site are visited from Cusco. In Peru one will also find the cute looking Llama and its lookalike the Alpaca, these animals are a cross over of the camel and the sheep and they belong to the Camelid family. Peruvian women go around with baby llamas which you can cuddle and take a picture with for a dollar. A visit to a Llama farm will enable you to taste an Alpaca hamburger and also buy a coat made from their wool.Mention also must be made of another very cute and tasty small fella – the Peruvian guinea pig.They get skinned and skewered just like our road side sheekh boti wallas. Soon it was time to say Adios Amigos to the Incas and move on to the country which is famous for being on the Equator as well as exactly in the middle of the world. Yes of course, how can one forget the Galapagos island where according to Charles Darwin, this is where life started. Yes you guessed it right welcome to ECUADOR. Almost at the top end of the south American continent, again completely nestled in the ravines of the Andes mountains at a height of 9000 feet above sea level is the capital Quito, enjoying nice cool weather year around inspite of the Equator passing thru it. A modern town with old world charm and beautiful buildings would best describe Quito. A statue of the Virgin Mary made of over 5000 aluminium sheets on the top a a hill is a must see. In my own terms I would call Quito the fruit and vegetable basket of the world. Any fruit , be it the exotic Avacodo or the humble apple is available for a mere one US $.. Yes you read it right the currency of Ecuador is the US dollar. The same quantity of avocados in Mumbai will cost you atleast 1500 rupees or nearly 25 times more !! Galapagos is a good 3 hour flight from Quito with a stopover at another big city of Ecuador- Guayaquil. On landing in Baltra, one takes a ferry to Santacruz island a lush green thickly vegetated terrain. 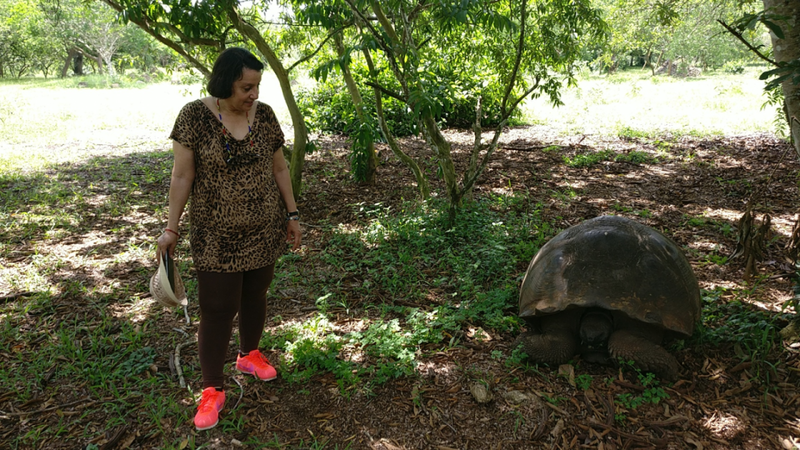 Our first stopover is a 600 acre private reserve where one gets the opportunity of a lifetime to walk alongside the famous Galapagos tortoises. It is a moment you can share with your grandchildren. After visiting these pre-historic animals all of whom are around a 100 years old, we visited a lava tunnel which has the stalagmite and stalactites sulphur coloured walls and the rippled floor formed from lava along this unique lava formations. 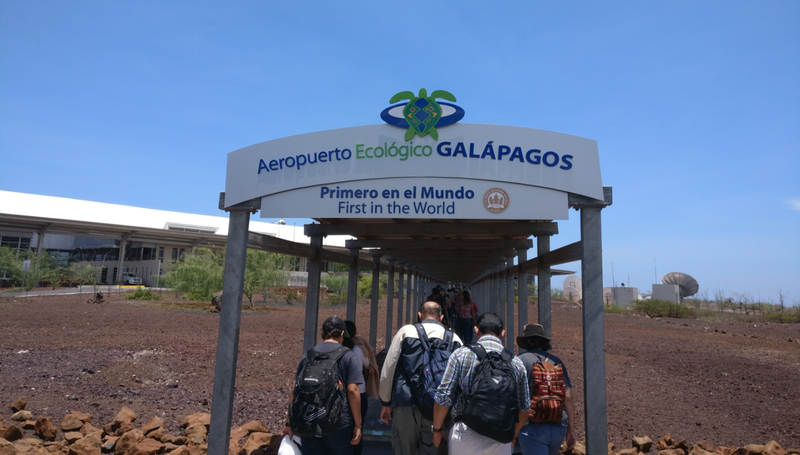 The main town of Galapagos – Peurto Ayora is where you go to visit the Charles Darwin research station and also see the breeding of the Galapagos tortoises in their farm in the station. The next two days were spent in visiting the islands on day cruises where we saw all the wild life like sea lions, sharks, different varieties of shell fish, exotic birds like the Frigate which has a wing span of 5 feet Then the blue footed boobies sitting on their eggs to hatch to add to bring more blue footed boobies to Galapagos. The very colourful land iguanas who are not at all camera shy and infact one feels they actually strike a pose for you. And if you are lucky you may even witness the male blue footed boobies performing their courtship dance to attract their girl friends. Inspite of the oppressive heat and humidity and also the enormous travel time from our country, Galapagos is a must visit destination. 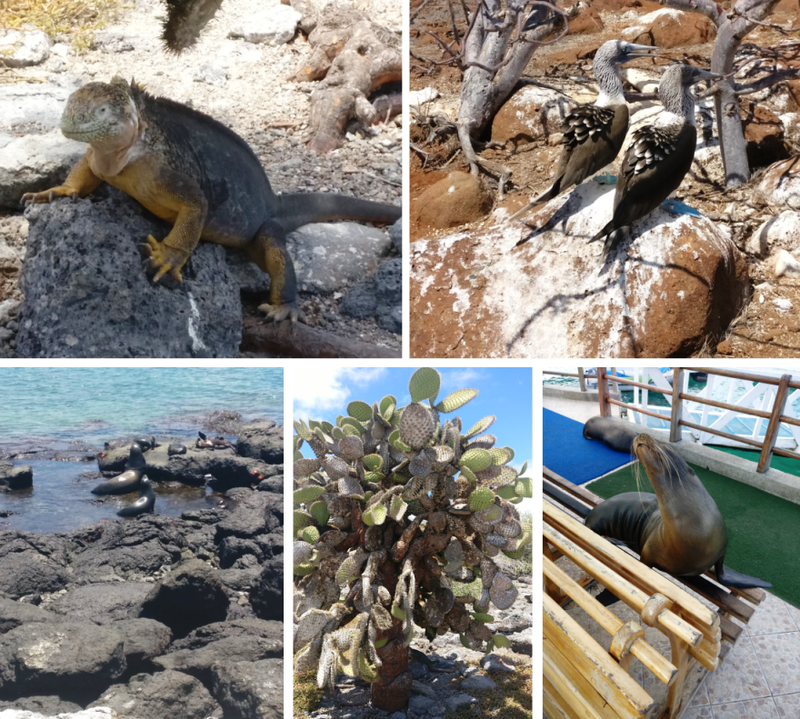 With Galapagos done and dusted we said our final Adios to our new found amigos in South America and made our long trek home. Bharat mata ki jai.